When using a slow cooker, there are a few tried-and-true tips to keep in mind. Remember, as tempting as it may be, avoid lifting the lid of your slow cooker during the cooking process to check on your soup. By taking the lid off your slow cooker, you will release the heat it has built up, which can affect your cook time and overall doneness. Slow-cooker liners (like these from Reynolds Kitchens) can be used to help cut down on cleaning time. No more scrubbing or scrapping baked-on ingredients. Don’t rush your herbs. One of the most common slow-cooker mistakes is to add fresh herbs too early in the cooking process. To prevent the delicate flavors from getting lost too early in your cooking, save your herbs for the final half hour before serving. Layer your ingredients in the proper order. The bottom of the slow cooker should be used for foods that take the longest time to cook, such as root vegetables like carrots or potatoes. If you want to freeze your soup, fill quart- or gallon-size plastic freezer bags and lay them flat in the freezer. Once they are frozen, your bags of soup can be stacked on top of each other to save space. 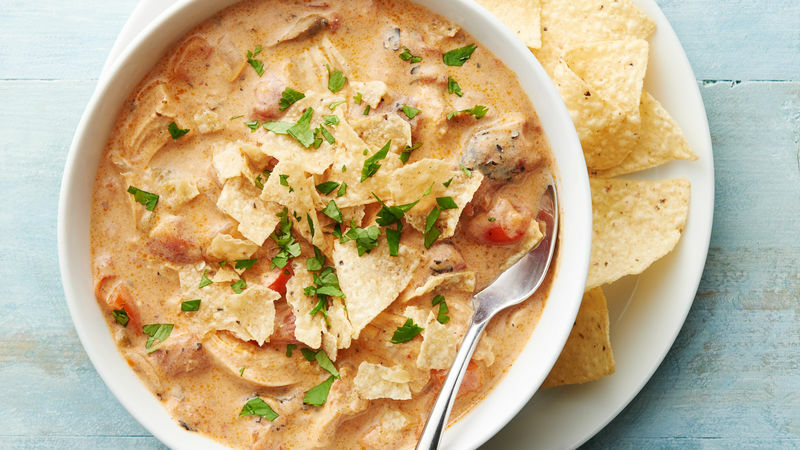 We’ve got even more slow-cooker soup recipes to tempt your taste buds! From slow-cooker pumpkin chili to slow-cooker creamy chicken and herbed dumplings, there’s a dinner for every day of the week.